With a 3-2 vote, Catoosa County commissioners approved purchasing a vehicle for the county manager's use. Catoosa County officials marginally approved a vehicle purchase for the county manager's office despite reluctance from two commissioners and criticism from the public. During the Board of Commissioner's meeting on Feb. 5, the board awarded an out-of-town bid for the new SUV after multiple residents questioned the purchase in the public appearances portion of the meeting. Former commissioner Ray Johnson was the first to offer advice. "I do hope y'all reconsider about this car and really think it through" Johnson said. Resident Cherise Miller, who also serves on the library's board of trustees, said the purchase is unnecessary. "I presume this vehicle is for the county manager since that department is the one requesting it," Miller said. "To my knowledge, we have never purchased a special vehicle for any other county manager. Why are we doing it now? The county should not be wasting money by purchasing new, expensive vehicles for anyone in our county government. I know that there must be other cars in the county available for the county manager to drive." When the vehicle purchase came up on the agenda, Public Works Projects Inspector Jeremy Bryson presented the bid recommendation to the board. "We had an invitation to bid back in January for a Ford Edge or Explorer," Bryson said. "The bids were opened on Jan. 31. We received several bids and after everything was evaluated and taken into account, the staff is recommending King Ford from Murphy, North Carolina, for a 2019 Ford Edge in the amount of $41,485." Commissioner Jim Cutler inquired about potential issues with some dealerships not having the vehicle readily available. Bryson confirmed that some of the 2019 models simply aren't available right now. "There's an issue. They're not manufacturing some of the 2019s for some time, so there are some issues with availability on some of those," Bryson said. Chairman Steven Henry explained the county's preference to go with a Ford vehicle. "We want to try to stay with one Ford manufacturer because we have better service," Henry said. Bryson added that the over whelming majority of county vehicles are Fords. "Most of our fleet is Ford," Bryson said. "So everything we have inventory-wise ... we don't have to have specialized equipment, computer software, certified mechanics, things along those lines. It's more practical to stay within the same vendor. We do all of our own fleet maintenance in house." Chairman Henry asked for a role call vote, at which time he and Commissioners Jeff Long and Jim Cutler voted yes, while newly elected Commissioners Charlie Stephens and Chuck Harris voted no. When new County Manager Alisha Vaughn was hired in September, County Attorney Chad Young pointed out that one of the only real differences between Vaughn's contract and that of her predecessor, Jim Walker, was that she would not have a monthly "take home" vehicle allowance. "There is no vehicle allowance in this one," Young said Sept. 4. "She's able to use a county car while she's here for county business, but not to drive back and forth to home." Resident George Battersby added that he personally didn't have a problem with the vehicle purchase since the previous county manager received a monthly vehicle allowance. "A guy that shouldn't have even been here, you gave him a car allowance of $500 a month, which more than covered a $40,000 car," Battersby said. Catoosa Projects Inspector Jeremy Bryson, during the Feb. 5 Commission meeting, discusses a change order that saves the county a little more than $53,000 on a resurfacing project. Catoosa County officials approved a deductive change order on its 2018 resurfacing project that came in $53,000 under the initial contracted price. During the Feb. 5 Board of Commissioner's meeting, Projects Inspector Jeremy Bryson discussed finalization of the project with the board and explained the savings. The project included approximately 4.64 miles of roadway along three roads: Stewart Road, Temperance Hall Road and Talley Circle. "This is for approval of a deductive change order to our FDR 2018 resurfacing project," Bryson said. "The original contract with C.W. Matthews Construction was for $1,888,917.15. After the work was completed and all the quantities were measured and adjusted, we saved $53,169.24. So, what we're asking is for you guys to do a change order to adjust for the actual contract amount, which is $1,835,747.91." The bid for the work was awarded July 3 and was partially paid for with Georgia Department of Transportation funds through the Local Maintenance Improvement Grant (LMIG). When the bid was awarded, Public Works Director Donald "Buster" Brown explained that $729,981 in LMIG funds were being contributed, with the county responsible for the remainder. The board unanimously approved the savings, and Commissioner Jim Cutler applauded Bryson and the department for the work being completed under budget. "I would like to thank Jeremy for all his hard work on this; $53,000 is a pretty good reduction," Cutler said. Catoosa County Director of Elections Tonya Moore, during the Feb. 5 Board of Commissioner's meeting, discusses the county's agreement to handle municipal elections for the city of Fort Oglethorpe. Catoosa County has finalized an agreement with the city of Fort Oglethorpe to oversee its municipal elections later this year. After handling some aspects of Fort Oglethorpe's elections in 2017, the Catoosa County Elections Office will now run every election in the county. Catoosa's Board of Commissioner's approved the agreement Feb. 5 after Director of Elections Tonya Moore explained the new responsibilities involved. "On March 8, 2017, we entered into a one-year trail basis agreement to handle the city of Fort Oglethorpe's election needs," Moore explained. That agreement, which expired Dec. 31, 2017, excluded the county handling the qualifying and collection of Fort Oglethorpe's ethics reports on candidates. Moore says the new agreement encompasses everything. "This request is for an ongoing contract, which means Catoosa County elections will handle all their elections services including qualifying, collecting their elected official's candidate ethics reports, and any and all special elections, even in odd-numbered years," Moore explained. The Board of Elections approved the contract on Jan. 8, and then the city of Fort Oglethorpe approved it during its Jan. 14 City Council meeting. Moore said the contract includes language that if either party decides to terminate the agreement, it must give a 90-day written notice. Moore added that the county already has such an agreement with the city of Ringgold. "We're already in contract with the city of Ringgold, Moore said. "We will now handle all the elections for the county and with both cities." The board members unanimously approved the contract. When Fort Oglethorpe officials approved the contract in January, Mayor Earl Gray opined that the agreement made a lot of sense from an efficiency standpoint. "I think it's a good solution and it's also going to put everything at the county where last year we were doing some of it here and some of it at the county," Gray said. "I think it's a good deal for the city." Catoosa County Commission Chairman Steven Henry, speaking at the Feb. 14 Catoosa County Chamber of Commerce Networking @ Lunch event at The Colonnade in Ringgold, explained how a TSPLOST would work. Voters will vote "yes" or "no" to the TSPLOST question on the March 19 ballot. On average, said Steven Henry, chairman of the Catoosa County Board of Commissioners at the Chamber of Commerce's first Networking @ Lunch event of 2019, the cost of paving a mile of road is $350,000. That's on average because different roads may need different kinds of maintenance, from resurfacing to fulldepth reclamation. In a video presentation shown during the luncheon, Catoosa Projects manager Jeremy Bryson explained that the county and its two cities lack the funds to maintain roads at a sustainable rate. Bryson said that ideally 21-28 miles of road a year should be resurfaced on a 15-20 year paving cycle. Instead, he said, the current rate is 5-10 miles a year on a 54-year cycle. Henry said the county has not had the funds for a long time to plan for the future. "If we don't prepare now, where will we be when growth takes place? We need to have a little foresight and having adequate funding would allow that." A good solution, said Henry, would be the 1 percent TSPLOST that residents will have a chance to vote on in March. TSPLOST stands for Transportation Special Purpose Local Option Sales Tax. Henry assured the luncheon audience that the funds from such a tax could only be spent on roads and road-related projects such as bridge repairs, multi-purpose walking trails, storm drainage and canoe launch maintenance. Currently, according to County Manager Alicia Vaughn, money for road maintenance comes from three sources. The general budget allots $80,000 for 2019. A Local Maintenance and Improvement Grant from the state will provide just over $745,000 in 2019, and SPLOST revenues will provide a little over $695,500. Henry said the advantage of a sales tax over additional property or other types of taxes is that everyone who shops in the county pays it. He said that 60 percent of the shopping done in the county is done by people who do not live here. "That's people who use our roads but people we do not have to provide services for," he said. "To me, it's one of the fairest forms of taxes." Henry estimates TSPLOST would generate around $50 million over five years. The collected taxes would be split among Catoosa County (70 percent), Fort Oglethorpe (20 percent), and Ringgold (10 percent), based on the miles of road and some road-related structures they must maintain. 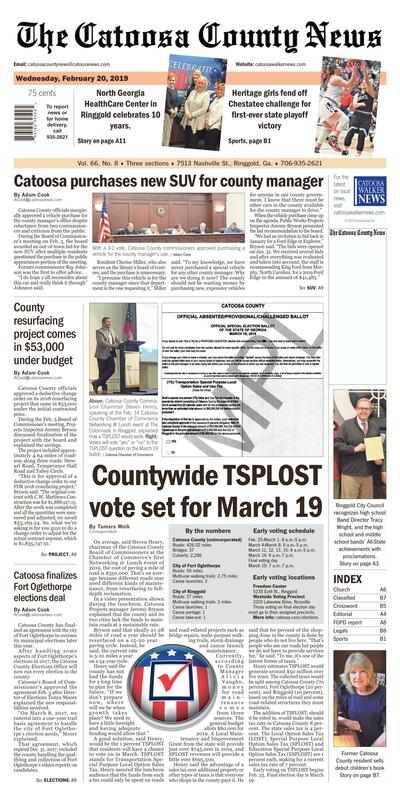 The addition of TSPLOST, should it be voted in, would make the sales tax rate in Catoosa County 8 percent. The state sales tax is 4 percent. The Local Option Sales Tax (LOST), Special Purpose Local Option Sales Tax (SPLOST) and Education Special Purpose Local Option Sales Tax (ESPLOST) are 1 percent each, making for a current sales tax rate of 7 percent. Early voting on TSPLOST begins Feb. 25. Final election day is March 19. Feb. 25-March 1: 8 a.m.-5 p.m.
March 4-March 8: 8 a.m.-5 p.m.
March 11, 12, 13, 15: 8 a.m.-5 p.m.
March 14: 8 a.m.-7 p.m.
March 19: 7 a.m.-7 p.m.
3319 Lakeview Drive, Rossville Those voting on final election day must go to their assigned precincts.